Thanks to selective breeding programs, Syrian hamsters now come in a wide variety of colors and patterns. One of the most popular is the orange and white. Some call this pattern brown-and-white or golden-and-white but it’s essentially the same pattern involving the natural orange-golden color of Syrian hamsters with white. 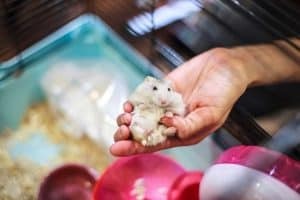 In fact, when you look at the natural coloration of the Syrian hamster, you’ll notice that like many of the burrowing rodents, these critters have a light-colored belly. With modern pet hamsters, however, the white coloration is different, with far more interesting patterns. The Orange and White Hamster Gallery! 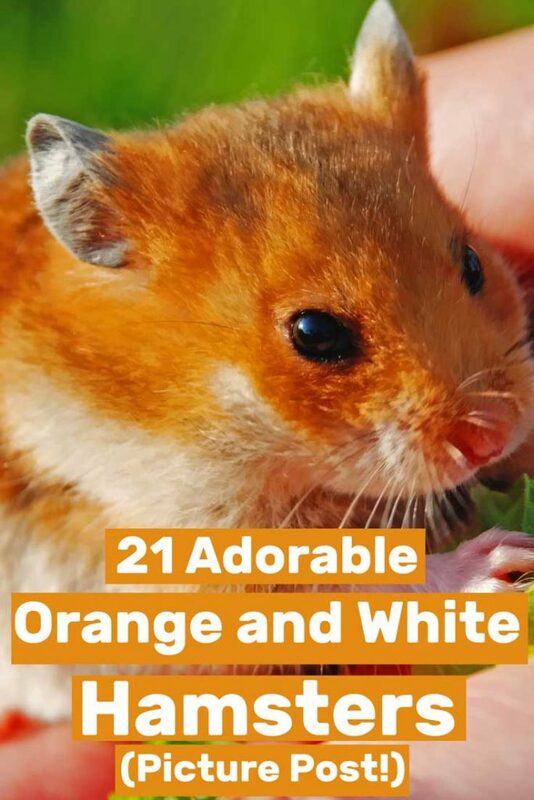 In celebration of this fun color combination, we gathered 21 pictures of orange and white hamsters for your viewing pleasure! As you’ll see, these can come in short or long hair varieties and have different patterns. Note the classic pattern though. The hamsters is nearly all orange, with lighter patches on the limbs and belly. This basket is a great way to make your hamster happy. It’s filled with lots of bedding she can burrow down into and feel hidden from the rest of the world. Since hamsters are prey animals in the wild, having places like this allow them to feel more secure. If you want more tips on having a happy hamster, check out our post with 25 ways to make your hamster happy! This orange and white hamster looks like he’s either scared or ready to fight. Either way, we can’t help but think he’s adorable standing up on his back legs like that! Maybe he’s been watching his humans walk like that and wants to try it out for himself. As for the color pattern, it again follows the classic “hamstery” color spread, only here the white patches are more prominent. We don’t know about you, but we feel like it would be impossible to get any work done with a cutie like this scampering over your keyboard! Not just because she’s in the way, but she’s irresistible. How could you not drop everything to give her a scratch? This adorable hamster appears to be a true bi-colored orange and white, possibly with some dilution in the orange color as well. This orange and white hamster is snacking on sorghum seeds, and it’s pretty clear he’s loving it! Since he’s also sitting on top of a pile of seeds and has a dust bath bowl in the background, he’s got to be the happiest hamster on this list! Check out the wonderful mix of white and orange on the hammy’s coat! Ok, so we know this hamster isn’t actually a model. But, if hamsters could be models, this one certainly would be! Just look at that sassy look she’s pulling off and how perfectly she’s planted her feet. If that isn’t a hamster modeling pose, we don’t know what is. We loved the coat pattern here too. This is almost a calico-patterned hamster! Showing patches of white, dark brown and orange to0. We’re not sure if it’s the way he’s sitting or if he’s really this chubby. Either way, this orange and white hamster is definitely enjoying his meal! If he is overweight, his owner should put him on a diet to keep him healthy and to help him avoid the health issues they can develop. In terms of coloring, this sweet hamster is cream-colored with cream being a diluted version of orange. It has some white too though. Did you know hamsters can run five miles every single night? It looks like this little gal is taking a quick break before getting back to it! They do this in captivity because in the wild they have to run far and wide to collect food and to escape from predators. Their bodies then have a huge built-in energy reserve that they need to use up somehow. Classic Syrian coat pattern there, albeit with more white than usual. Who knew a hamster tongue could be so cute?! Yet here this little guy is. He’s got to be licking his lips because there’s no way he’s sticking his tongue out to be mean. Hamsters are far too nice to use their tongues for anything but tasting food, grooming themselves, and nibbling their humans. Another blondie here! We love all the fun colors in this hamster’s cage too! It looks like she’s got a big chew and doesn’t quite believe it’s actually all for her. Lucky for her, her owner loves her and has provided her with something she can gnaw on to keep her teeth properly worn down. If you want to learn more about hamster chews, you can check out our post on the best hamster chews! This little sweet pea looks like he just woke up. It also looks like he’s not quite ready to be “up and at ’em.” Hopefully, if it’s during the day his owner let him sleep. Hamsters are active in the evening, morning, and/or nighttime hours so they need to sleep during the day. This adorably fluffy hammy has the most beautiful combination of white, cream, and shades of orange, all over its body and face. We can’t tell if this gal is purposely posing like this to look fabulous or has just discovered the glass corner of her cage. Either way, we love how cuddly this orange and white hamster is! Her fur makes us want to drop everything to pick her up and pet her. This one is truly a teddy bear hamster – no matter what your definition of teddy bear hamsters is! Sometimes, it can be hard to see just how cute your hamster is because they’re so small. Thankfully, there are pictures like this one that captures every detail of these incredible pets! Just look at all those little white whiskers and those bright black eyes. Has your heart melted yet? 14. 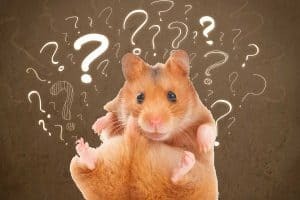 Curiosity Killed the… Hamster? Like most animals, hamsters are naturally curious. This one seems interested in whatever device his owner is using to photograph him. We’re more than happy about their natural curiosity since this picture wouldn’t exist without it! If you look closely, you can see that this guy has both black and white whiskers. So cool! In the wild, hamsters build fairly elaborate tunnel systems. This gal (Take the time to appreciate the intricate white and orange on her!) has some man-made ones but looks excited to try it out. We think as soon as she finds the entrance, she’ll be thrilled to scurry through the maze. We hope her owner switches it up every once and a while so she doesn’t get bored. Although this hamster hiding place looks a bit too small for this guy, he doesn’t seem to mind. It gives him a safe place from which he can see what’s going on outside, so he’s more than happy to be tucked inside. This picture is also fun because you can see his teeth, which you don’t see too often. 17. White and Orange Baby Hamsters! We apologize for any cuteness overload you may be experiencing because of this picture, but how could we resist including it? These five fuzzy friends are just begging to be snuggled. They also look like they’re almost big enough that they’ll need their own cages. Look at their coat patterns too. How they all support various combinations of orange and white. It’s interesting to see the difference between the cream-and-white ones and the orange-and-white ones. Need more baby hamsters right now? Check out our gallery of 56 baby hamster pictures! This orange and white hamster believes there’s no better place to have a snack than in bed, and who could blame him? His bed looks particularly plush and inviting. 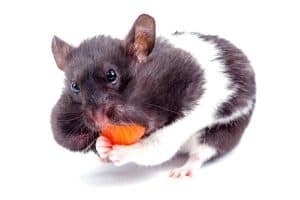 Although it’s likely his owner gave him this snack, many hamsters keep their food storage near their bed so they’re never too far from a bite to eat. Normally, hamsters are cute little balls of fluff. So, what happens when one stretches? They turn into an elongated ball of fluff. It’s kind of fun to see just how long these guys actually are, though, when they’re not curled up in bed! It also probably feels good to stretch after sleeping in cramped quarters all day. And this yoga posture also allows us to examine the intricate pattern of patches, as the orange section of the hamster’s coat interacts with the white. We can’t help but wonder if this hamster is getting ready to help with homework or force her owner to convince her teacher that her hamster ate her homework. At any rate, she’s so cute I’m sure she’d be forgiven if she did try to turn that math assignment into lunch! He’s a gorgeous example of cream and white, perfectly modeled in long-fur too! It looks like this guy is checking in on his owner as he gets to spend some time running free. Although we don’t recommend allowing your hamster the run of the house since there are so many problems they can get themselves into, he seems to be well-monitored. We hope you enjoyed this list of 21 adorable orange and white hamsters! As you can see, hamsters are cute pets with fun personalities. If you already have a hamster or are considering getting one, be sure to read through our hamster care section to learn everything you need to know about caring for one of these animals. If you’re looking for more hamster pictures, we’ve got you covered. Check out our post with 29 adorable black and white hamsters for some panda hamster fun!